Access to CRO Tracker is currently free of charge to Sponsors with an interest in outsourcing R&D services. How is access to the database controlled? Online registration is required to obtain basic access to CRO Tracker. Registration is free of charge and available to all visitors at Register Now. CRO Tracker has different levels of access authorisation depending on the type of visitor (Buyer/Supplier or Other). Please see our Access Policy for further details. How will CRO Tracker help me? 1) Delivering R&D Outsourcing Solutions: CRO Tracker delivers outsourcing solutions to challenging R&D requirements. 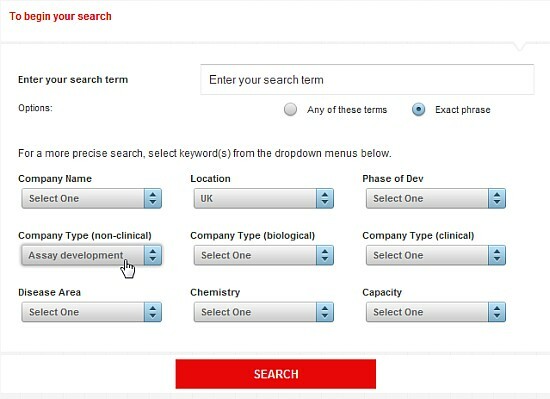 With over 300 CROs participating, CRO Tracker can support your problem solving over a wide scope of R&D disciplines. 2) Effective Time Management: CRO Tracker can help you to arrive at R&D outsourcing solutions within a few clicks. CRO Tracker helps you to arrive at solution providers quickly and effectively, leaving you free to progress with your R&D outsourcing objectives. 3) Relationship Building: CRO Tracker provides the bridge between buyers and suppliers helping you to initiate communication with the right contact and the right service provider. How can I communicate with a profiling vendor? You can use the Request for Information ("RFI") button on the vendor profile which will email the recipient with your enquiry. Alternatively, you can use the contact details listed within the vendor profile or the website field link to access the vendor�s web page. How will I communicate with a Vendor after my initial contact via CRO Tracker? CRO Tracker allows you to make e-mail contact with a vendor using the "request for information" function. This request for information is a form sent by the sponsor to the specific vendor and will be delivered to the inbox for the designated vendor contact. The vendor contact must then reply to you outside of the CRO Tracker resource using the normal communication routes. How can I search CRO Tracker? How is the CRO Tracker Key Word Ranking System structured? 1) Currency of the CRO profile. 2) Exactness of search. An exact search term match will generally be higher than a non-exact search. For example, if you search for 'CRO' you would not expect to have hits that contain 'miCRObial' but would expect 'CROs'. 3) Correct matches with certain key fields (Company Name and Company Type) will generally lead to a higher ranking. How do I manage my search results? Upon performing a search, CRO Tracker offers sponsors the option of filtering out vendors that capture their utmost interest and save them to a Favourites list. Sponsors can then access this exclusive list and make email contact with their favourite vendors by sending an enquiry to all, at once. To further add to the convenience of evaluating and reviewing multiple vendor profiles, sponsors can view search results in a tabulated format in one single page. � Copyright Bio2Business 2012. All rights reserved.